To best convey meaningful messages with effective calls to action, strive for both beauty and function. The most celebrated ads, for instance, epitomize minimalist approaches that are incredibly effective despite their simplicity. Less is more. Yet, in sharp contrast, consider a typical accounting firm proposal. Most are generated from canned, firm-centric copy and lead with generic ‘thank you for this opportunity’ letters that list various documents as a recap of the “order” just taken. The letter is followed by generic ‘approach’ verbiage and lots of facts about the firm. Some joke that proposals should be graded on weight. This summary belongs at the front of the proposal and often suffices as the entire print presentation. This approach saves hours or days you would spend on old-style, less-effective proposals. If it feels odd using just the project summary, possibly follow it with a supporting page or two of engagement details. But test yourself. Are the details just internal tasks? If so, why include them at all? You needn’t list all your inputs and activities to justify a price. As huge technological efficiencies come to our profession, it is an unwise move because it reinforces the wrong thing. Details about outcomes and impacts are more relevant and they help your firm form the habit of speaking in the language of results. For extra punch, add a page or two of graphical information very specific to the prospect (e.g., a diagram of how they stack up from a benchmarking perspective) to demonstrate deep industry knowledge. Along with the summary, it is okay to feature qualifications such as bios, relevant experience, and references, but put this ‘about us’ info last. Firm history, associations, general peer review facts, and other items that can be found online are best simply cross-referenced to your website. Meaningful content emerges from great conversations. You cannot know what outcomes a client wants without good dialogue. Those who craft proposals seldom receive the most powerful background information from people who have interacted with the prospects. Why? Perhaps the pursuit team did not ask good questions. Or marketing did not seek the debrief. Or time did not allow on an eleventh-hour proposal. Stop permitting information gathering deficiencies in your proposal process. Obtain essential information that makes a proposal really spectacular. In the absence of solid impacts to include for a highly-relevant, more client-centric proposal, you have little choice but to fill pages with all-about-us fluff and regurgitate the dull list of compliance reports the client specified; the same list your competitors will also restate. Firms do so much more than compliance! Yet few accounting proposals reflect so. To provide a proposal that humans will emotionally connect to, know their goals and challenges, and get to their core purpose. Purpose is the reason behind the reason behind the reason for the project. For example: ‘To have more operating capital’ is not a purpose. Neither is: ‘We want to grow.’ Why do they want to grow? Do they want to grow quickly to sell at a profit? Grow to create a business the family can work in for generations to come? Grow to succeed in making a measurable difference like solve a dilemma, eliminate a problem, or improve a condition? Each of these potential purposes would trigger distinct sets of solutions for your firm to offer. Through discussions (and repeated use of the word ‘why’), you will get to the core. Reflect back what you heard to make sure you have it just right. And when problem solving for a client, ensure you know—and can articulate—the difference between the root cause, problem, symptom, solution, and prevention. It is possible you are hired based on one or more symptoms, so a bulk of your project might be to determine the problem(s) and alleviate root causes. Be mindful of this and explicit about it in your proposals. Avoid the urge to oversimplify your problem solving in the proposal stage. This is where your firm’s greatest value is! Provide your buyers with choices. Accounting firm buyers particularly welcome options because it allows a feeling of control when otherwise required to buy (i.e., compliance). There is a lot to know about building options, but one thing you will want to address is how you present multiple options concisely. First, heed the advice above. The next step is to group any services you intend to include by the outcome or result they garner, which is the ‘why’ or the purpose that work will serve. The illustration to the right depicts the anatomy of an option-priced project summary. The project ‘whys’ are listed down the left of the table. Across the top are package options. Within the non-title part of the grid (the green cells within the red frame) describe what the client receives (not the firm’s activities, aka tasks! )—this takes a mindset change. Each row likely includes multiple services applicable to the desired outcome. Within these cells, be specific about quantities, timing or other parameters and qualifiers for each price you are proposing. Do not underestimate the power of non-product options, as well. 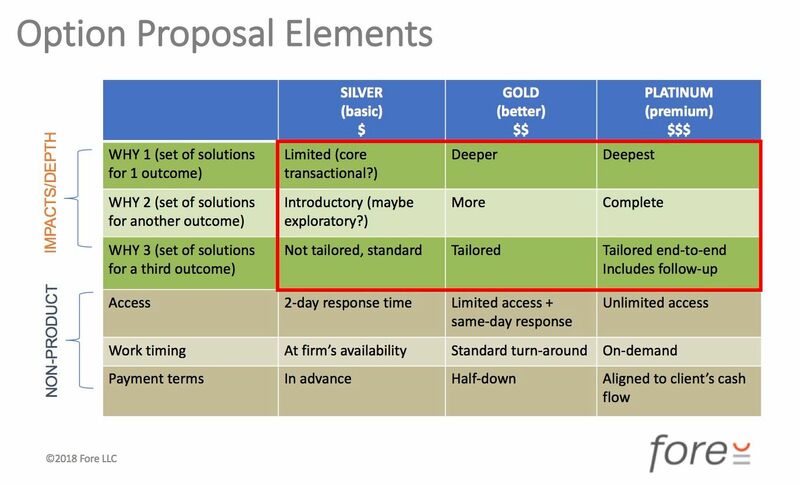 When it is hard to distinguish between solution levels on simplistic project proposals, you can always distinguish between levels of access, work timing, or payment terms and timing. In this type of project summary, the grid is not for illustrating all or nothing (‘included’ vs. ‘not included’). Rather, it is for describing increasing levels of depth as you move across the grid. In other words, even the base level includes SOME work toward their purpose/why that you have based that row on. The highest option represents the most progress you will help them achieve and the lowest option represents the least progress they might elect to work toward at this time. Show how different service combinations will achieve different results. Many CPAs find all-about-us fluff quite acceptable—even ideal—in proposals. But once you show your colleagues what a highly compelling proposal looks like, and they experience its effectiveness, they will stop settling for mediocrity, even when it means more work for them in the preparation phase. You will play a major role in growing the firm through this proposal approach that is in effect a larger business-development-process change. Track your results and you will find what other firms do—that more than 60 percent of buyers select the middle or highest option. Happy growing!